From noted Jack London scholar Earle Labor, a revelatory look at the life of the great American author—and how it shaped his most beloved works. Jack London was born a working class, fatherless Californian in 1876. In his youth, he was a boundlessly energetic adventurer on the bustling West Coast—an oyster pirate, a hobo, a sailor, and a prospector by turns. He spent his brief life rapidly accumulating the experiences that would inform his acclaimed bestselling books The Call of the Wild, White Fang, and The Sea-Wolf. The bare outlines of his story suggest a classic rags-to-riches tale, but London the man was plagued by contradictions. He chronicled nature at its most savage but wept helplessly at the deaths of his favorite animals. At his peak the highest paid writer in the United States, he was nevertheless forced to work under constant pressure for money. An irrepressibly optimistic crusader for social justice and a lover of humanity, he was also subject to spells of bitter invective, especially as his health declined. Branded by shortsighted critics as little more than a hack who produced a couple of memorable dog stories, he left behind a voluminous literary legacy, much of it ripe for rediscovery. 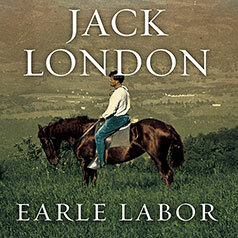 In Jack London: An American Life, the noted Jack London scholar Earle Labor explores the brilliant and complicated novelist lost behind the myth—at once a hard-living globe-trotter and a man alive with ideas whose passion for seeking new worlds to explore never waned until the day he died. Returning London to his proper place in the American pantheon, Labor resurrects a major American novelist in his full fire and glory.